You are currently browsing articles tagged Lt. Col. Christopher Downey. Imagine, for a moment that you are a Lieutenant Colonel (LTC) in the United States Army and you have been accused of a crime you did not commit. You are called before and an Article 15 hearing, found guilty and released from command. You are then called before an Army Show Cause Board to determine if you should be forced to retire from the military. You are informed you will not need a lawyer, only to find yourself before a General who is flanked by two. During a proceeding that lasts five hours, you are asked legal questions you cannot answer. After your grueling ordeal you narrowly survive a forced retirement, in spite of the fact that you are found innocent of wrong doing. This is what happened to LTC Christopher Downey. While serving as the Presidential Airlift Coordinator, Lt. Col. Downey’s supervisor described him as being in the top 1% of hand picked officers. It all began with a formal military ball where two lesbian officers –one a Captain the other a Lieutenant—were seen engaging in prolonged kissing and other lewd behavior while on the dance floor. LTC Downey noticed one of his enlisted soldiers photographing the indecent scene. He stepped and lowered the camera which inadvertently touched soldier’s nose. LTC Downey’s motives were the most upright possible. He feared the photos would end up on social media and wanted to safeguard his unit’s reputation and that of the two [female] officers, who had clearly lost all sense of propriety. We can only fully appreciate the travesty of the case when we make a contrast. The gross conduct of the lesbians was clearly unbecoming of an officer. Yet the officer punished had, up till that point, a stellar 24-year Army career that would make any patriotic American proud. While serving as the Presidential Airlift Coordinator for the White House, Downey’s supervisor described him as being “clearly in the top 1% of hand picked officers.” This is by no means hyperbole. With over 1000 combat flight hours and three tours of duty, LTC Downey earned 3 Bronze Stars and 7 Air Medals: one with a “V” device for valor. Col. Charles Waterhouse painting of Col. John Ripley dangling under the Dong Ha Bridge as 30,000 enemy troops try in vein to kill him. 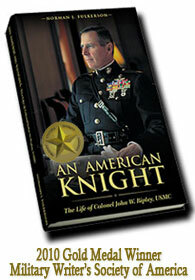 Col. John Ripley, subject of An American Knight, showed the same moral courage as LTC Downey when he testified against the flawed policy of DADT. Col. Ripley finished his passionate appeal before members of the Committee in military terms. He begged them, “not to lead us into this ambush from which we can never recover.” LTC Downey’s case looks strikingly similar to an ambush. Will he recover? Will the stain on his otherwise spotless career be expunged? Will he once again be able to provide an example for the junior enlisted of what a military officer looks and acts like? God only knows. While he remains a soldier in the service of America his career is hanging in limbo and the finality of the case is still pending. The Marines Hymn speaks of the “few and the proud” guarding the streets of heaven after they have passed on. It is safe to say Col. Ripley, while standing by the pearly gates, smiles down upon LTC Downey and sharply salutes him for his principled stand. It is also likely that he is rolling over in his grave for an unspeakable injustice against such an outstanding officer.